by hand at home: seasons round exchange - light! presenting: our nature table (aka mantle) with sweet gifts from my partner, andrea. the theme for this winter's seasons round exchange was 'light', and andrea really nailed it. 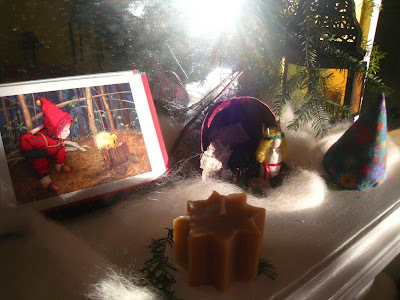 even with my waldorf-y background, i never thought of santa lucia! isn't she adorable? 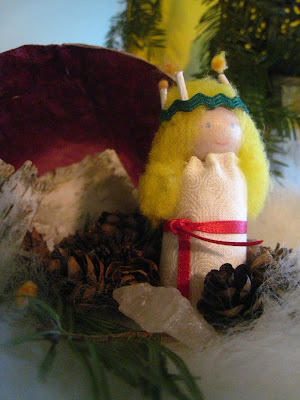 she's standing amongst little nature bits and a crystal in front of a small paper mache bowl (with golden flecks) - all made and sent by andrea from maine. i especially love the birch bark. 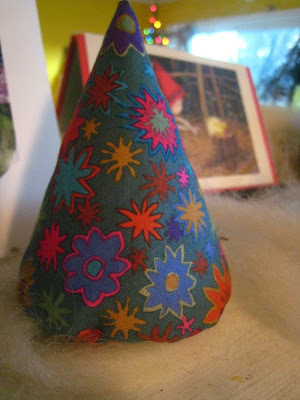 plus, an adorable tree that has been a fun plaything for the little guy, and earned compliments from guests. it's weighted on the bottom with beans, i think, to keep it upright. one of the stipulations of the seasons round exchange is using all natural materials for all of your items. bravo! andrea also sent a gorgeous card, a beeswax star candle, and a copy of the latest issue of her zine, GEMINI (not pictured). you can see her post on the exchange for more pictures or to get more details on it all! so, here's what i sent, getting ready to go. i nestled everything in fresh greens from mt. hood ntl. forest, where we cut our tree this year ($5 permit from the ranger station - so fun, but so so cold!). i sent a crystal window hanging (blogged). the six-sided version was a lot harder than anticipated, so i had marc's help with engineering and nailing! i just strung a simple star of david with blue mohair, but i think many different lacings and weavings could be made! this project will continue to evolve in our household! 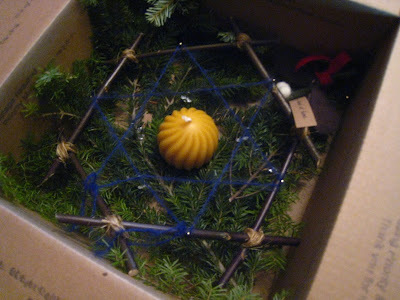 i also sent a little mistletoe (a symbol of life & light in the dark winter months), and a handmade beeswax candle. had help on that too - made by my booth partners at the sunnyside environmental craft fair, song garden school. 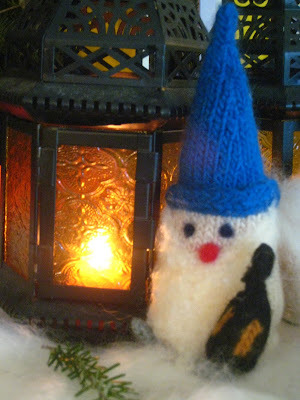 my favorite offering was this little lantern-bearing gnome, knitted up in light bright icy colors and felted. i shared this pattern in my insanely long sock summit post; it's another design by marie mayhew. i needle-felted his eyes and nose, and used a little thread to tack down his beard (which covers his cute pointy shoes!). i also sent a big bunch of wool roving - it's all over our seasonal display (and tree too), masquerading as snow. we had the tiniest sprinkling on christmas eve morning, but no white christmas here in portland. lucky for us, we always have an abundance of wool! more seasons round photos and nature table inspiration here and here!